Mobile, Alabama usually vies with Seattle for the city in the continental USA with the most rainfall. If the dry conditions here continue, though, Mobile will get less than half its 80 inches or so of rain this year. Which makes for some interesting visitors in our yard. With the house here close to a fresh water canal and also having a couple of low places that hold moisture well even in dry periods, our grass and green areas don’t look much like a drought. 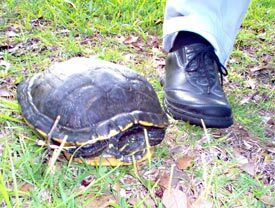 It seems every other turtle in Mobile has found its way down our dirt road, because we sure see a lot of them, especially in the morning. Sometimes there are as many as four of them crawling around. They aren’t water turtles, but since they like green stuff to eat, they find plenty of that around the house, even in this dry spell. We took a picture of the largest one of the bunch so far, next to Monica’s foot. A little camera shy, but once we left him (or her) alone, he took off at turtle speed for a less busy place in the back yard.